STOCKHOLM, Sweden—November 7, 2018 - Propellerhead Software today released the Umpf Retro Beats Rack Extension, making it easier than ever to create old-school beats in Reason music software. Umpf Retro Beats is an innovative drum machine featuring retro sounds and grooves sampled from classic drum machines. Perfect for 80s, Retro Pop and Synthwave style beats, Retro Beats is loaded with over 750 samples, drum kit presets and authentic analog effects. In addition to traditional purchasing options, Umpf Retro Beats is available through the new Propellerhead Rent-to-Own Program, which offers an affordable, flexible way to expand your Reason Rack. 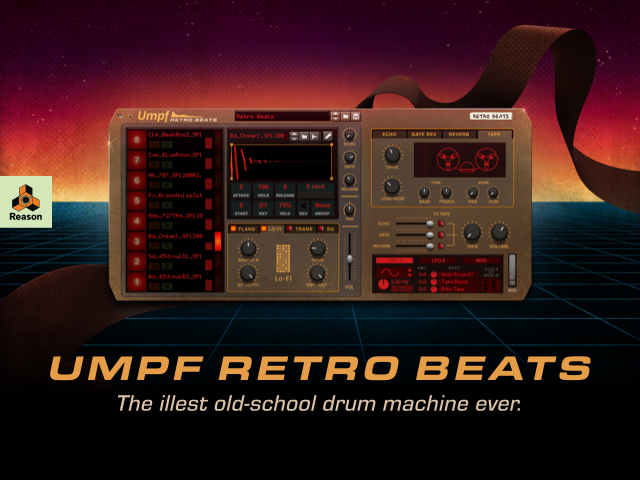 Umpf Retro Beats boasts over 750 vintage sounds and kit presets inspired by classic drum machines of the 80s and 90s. Retro Beats features eight drum channels with drag-and-drop sample loading and an intuitive dynamic waveform display customizing sounds. Retro Beats offers authentic analog signal processors including old-school tape, echo and gated reverb effects, as well as an advanced Modulation Matrix for chopping and screwing beats. Partner Retro Beats with the complimentary drum sequencer for instant inspiration. Packed with dozens of unique patterns and rhythms, Drum Sequencer can instantaneously bring samples in Retro Beats to life. To learn more about Umpf Retro Beats, visit https://propellerheads.com/reason/rack-extensions/umpf-retro-beats for further details. Umpf Retro Beats is available for immediate download via the Propellerhead store and will retail for $99 USD / €99 EUR. Umpf Retro Beats is also available via the Propellerhead Rent-to-Own Program for $/€ 9.99 per month. To learn more about the Rent-to-Own program, visit https://www.propellerheads.com/rent-to-own for further details.